The 31st Legislature is getting underway in Juneau. The Senate and House both gaveled in on Monday and swore in new members. On Thursday, Foster was elected Pro Tem of the House until the House gets organized. There were no prefile bills that impact commercial fisheries; however, on Wednesday Senator Stevens re-introduced the Shellfish enhancement bill, now SB 22. SB. 22 – Shellfish Enhance. 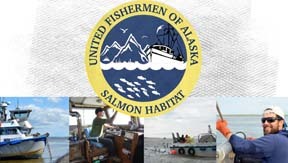 Projects; Hatcheries- “An Act relating to management of enhanced stocks of shellfish; authorizing certain nonprofit organizations to engage in shellfish enhancement projects; relating to application fees for salmon hatchery permits; and providing for an effective date” a bill introduced by Senator Stevens on January 16. Bill was referred to Resource and Finance Committees. In other developments, the UFA board voted on Tuesday to adopt our 2019 Legislative Plan which includes former bills that we hope will be re-introduced. In federal news, UFA recently drafted a letter to our delegates in DC asking they support Senate Bill S. 21 a bill that would support Coast Guard funding during the government shutdown.